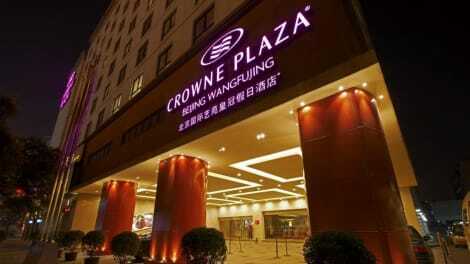 Crowne Plaza Beijing Sun Palace is located in Taiyanggong area, close to China International Exhibition Centre, China National Convention Centre, Yansha and Wangjing Commercial Areas. Taking the high-speed way to the Great Wall only takes an-hour drive. Yonghe Lama Temple, Olympic Green, Sanlitun and 798 Art Zone is also nearby. Get into Beijing Capital Airport, only 25 minutes driving distance from the hotel or walk to metro line 10 and line 13 within 10 minutes. Aegean Mall next door provides you convenient options of shopping and entertainment. The 25-storey landmark tower features 515 well-designed and spacious rooms and suites with panoramic view of the city. The hotel stands out with its comprehensive facilities consisting of 2 ballrooms, 1 outdoor marquee and 13 multiple function rooms, catering to all sizes of meetings, conferences and social events. The hotel also combines with a choice of innovative restaurants and bars. Award-winning Rainbow Restaurant offers a range of unique Yunnan flavors. Master Chef Kong in JUN Restaurant uses the freshest ingredients from Yunnan to create his unique style of healthy Cantonese cuisine. The Market Restaurant selects the best ingredients and tempts wonderful taste, with a healthy twist of modern ideas in every dish. Level One Bar serves over 20 kinds of imported beers with homemade burgers to create the perfectly evening. Take a dip in the F6 indoor swimming pool or work out in the modern gym, as part of your relaxing stay. Level One - your definitive neighborhood sports bar is celebrating it’s much awaited spring opening late April. The impressive location along Taiyanggong area at the Crowne Plaza Beijing Sun Palace offers a cozy space that will treat sports fans to an unprecedented viewing experience featuring a 180 degrees projection TV screen, personal TV flat screen, expansive lists of beer, vintage whiskies, boutique wines and Bespoke cocktails.This restaurant offers a whole range of unique flavours of Yunnan which is famous for dishes prepared from very fresh ingredients and wild mushrooms; from healthy to spicy to traditional fruit wines. The decor is very colourful with Yunnan cultural bricks, paintings and services staff in beautiful Yunnan costumes.Enjoy daily menus fresh from the market and extensive Pan Asian and Western delights from the interactive open kitchen.At JUN we offer only the freshest local produce carefully chosen by our top class culinary team and we fly in Yunnan's finest wild mushrooms to your plate while Guangdong vast farmland greens and delicacies are perfectly cooked to excite your dining appetite. Master Chef Kong is originally from Hong Kong and stands out with his inventive understanding on the cooking art of Cantonese. He ranks among Asia Pacific Region TOP 10 Golden Chefs with a Blue Ribbon Medal of Honor.Great place to meet friends and business colleagues for a caf? latte or a refreshing cocktail at any time and enjoy the tunes of our Steinway Grand Piano. Enjoy afternoon High Tea, available daily or relax with friends after dinner to the serenade of a live 3-piece band. Make yourself at home in one of the 290 air-conditioned rooms featuring kitchens with refrigerators and microwaves. Wired and wireless Internet access is complimentary, and plasma televisions with satellite programming provide entertainment. Conveniences include safes and desks, and housekeeping is provided daily. 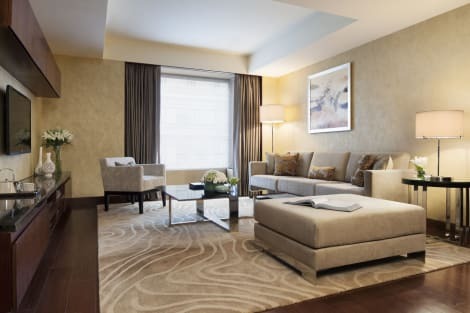 With a stay at The Imperial Mansion, Beijing Marriott Executive Apartments, you'll be centrally located in Beijing, within a 10-minute walk of Changpu River Park and Tiananmen Square. This 4.5-star apartment is 0.8 mi (1.3 km) from National Museum of China and 1.1 mi (1.7 km) from Forbidden City. Take advantage of recreation opportunities such as a fitness center, or other amenities including complimentary wireless Internet access and concierge services. Additional features at this hotel include wedding services and a banquet hall. With a stay at Renaissance Beijing Capital Hotel, you'll be centrally located in Beijing, within a 15-minute drive of Wangfujing Street and Panjiayuan Antique Market. This 4.5-star hotel is 3.5 mi (5.6 km) from Sanlitun and 4.5 mi (7.3 km) from Tiananmen Square. Make yourself at home in one of the 65 individually decorated guestrooms, featuring refrigerators and free minibar items. 40-inch flat-screen televisions with satellite programming provide entertainment, while complimentary wireless Internet access keeps you connected. Private bathrooms have designer toiletries and hair dryers. Conveniences include safes and desks, as well as phones with free local calls.